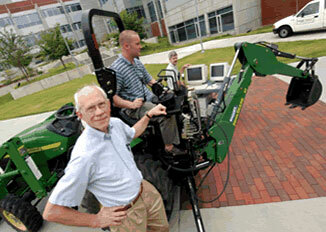 Dr. Book began at Tech in 1974 as an Assistant Professor. He has maintained a longstanding interest in robotics, automatic controls, and in the special topic of his Ph.D. thesis, the control of flexible motion systems. He was instrumental in the formation of the Computer Integrated Manufacturing Systems (CIMS) Program at Georgia Tech, serving as its founding director from 1983 to 1988. In 2001 he was appointed to the HUSCO/Ramirez Distinguished Chair in Fluid Power and Motion Control. Shortly thereafter he established the Georgia Tech Fluid Power and Motion Control Center. He retired from Georgia Tech in June of 2011 and was granted emeritus status and continues to be active in that capacity. The research Dr. Book has engaged in clusters around topics well suited to the laboratory he has named the Intelligent Machine Dynamics Laboratory. His longstanding interest in improving the capabilities of flexible robot arms is an example. This work began with the National Aeronautics and Space Administration's support of his doctoral dissertation, and has been supported over the years with funds from NASA, the Department of Energy, the National Science Foundation, Cincinnati Milacron, NEC Corporation, IBM, and Ford Visteon. Many aspects and approaches to expanding the envelope of the design space to lighter, faster, more precise motion systems have been explored in conjunction with numerous graduate students and visiting scholars. Other aspects of the dynamics of intelligent machines explored have included how they can better be actuated hydraulically and electrically, how their position can better be sensed, how they can be used, and how they can be modeled. With support from the National Science Foundation, Dr. Book leads a group of faculty to create a computer input and display for haptic shapes called Digital Clay. (A haptic display presents force in resistance to movement.) In other work, he and his students explore passive actuation of machines intended to guide the motion of human users in possible applications, such as heavy equipment operation, virtual reality, exercise machines, and computer assisted surgery. He is the Georgia Tech P.I. for the NSF Center for Compact and Efficient Fluid Power. The application of control to intelligent machines is especially exciting to Dr. Book in this era of ever improving computer capabilities. He says, "The things we dreamed of doing a few years ago with computer control are now practical and even essential to competitive products." Displacement Sensor, U.S. Patent 7,521,921 with Haihong Zhu, April 21, 2009. Gao, Dalong and W. J. Book. 2009. Steerability in Planar Dissipative Passive Robots. International Journal of Robotics Research, 29(4). S. Rhim and W. J. Book. 2004. Adaptive Time-delay Command Shaping Filter for Flexible Manipulator Control. Transactions on Mechatronics, 9(4), 619-626. S. Munir and W. J. Book. 2003. Control Techniques and Programming Issues for Time Delayed Internet Based Teleoperation. Journal of Dynamic Systems, Measurement, and Control, 125(2), 205-214. D.-S. Kwon and W. J. Book. 1994. A Time-Domain Inverse Dynamic Tracking Control of a Single-Link Flexible Manipulator. Journal of Dynamic Systems, Measurement, and Control 116, 193-200. W. J. Book. 1993. Controlled Motion in an Elastic World. Journal of Dynamic Systems, Measurement, and Control, 50th Anniversary Issue (March), 252-261.